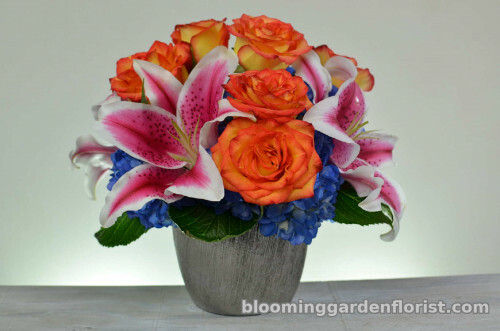 A beautiful combination of fragrant Stargazer lilies, blue hydrangeas, and vibrant roses designed artfully in a unique silver cube glass vase. As pictured with 6 roses, 4 blue hydrangeas, and 3 lilies. Larger design with 9 roses, 4 blue hydrangeas, and 5 lilies. Larger design, larger container, with 12 roses, 4 hydrangeas, and 6 lilies.